The Urban Redevelopment Authority (URA) announced on July 24th that it will be rezoning some residential sites in the Tiong Bahru estate under the Master Plan, from ‘Residential’ to ‘Residential with Commercial at 1st storey’. This is to recognise existing businesses with approvals and specify where commercial uses are allowed in the estate, while sustaining its residential amenity. The Tiong Bahru estate has about 800 homes and 2,400 residents. There are commercial uses distributed throughout the estate today that provide residents and visitors a wide range of amenities, such as a hawker centre, shops and a wet market. This includes about 120 authorised businesses located at the 1st storey of residential buildings, mostly within the conserved pre-war Singapore Improvement Trust (SIT) flats. They comprise F&B outlets and restaurants, as well as retail shops and services which make the estate a vibrant lifestyle enclave that draws visitors from all over Singapore. These 1st storey businesses are currently operating based on different approvals. More than half are on land zoned ‘Residential with Commercial at 1st Storey’ under the Master Plan. There are also 28 units on land zoned ‘Residential’, with authorised 1st storey businesses based on approvals given by agencies over the past decades. These approvals include Written Permission by URA from the 1960s to 1970s, and leases issued by the SIT from the late-1940s. The 28 units are mostly located between Eng Hoon Street and Eng Watt Street, and have over time become an integral part of the estate’s fabric. URA said that the Tiong Bahru community has provided feedback in recent years regarding the growing number of commercial uses in the estate, and their impact on the residential neighbourhood. URA has also engaged the local Adviser, grassroots leaders and residents to better understand their views. The community shared that they were supportive of the estate’s vibrant character, and having a good mix of businesses to serve residents and visitors. At the same time, they emphasised the need to maintain residential amenity, so that residents can continue to have a good living environment. The community also wanted more information on where commercial uses are allowed in the estate. URA has conducted a study on the uses in the estate, taking into account the community’s feedback. URA will recognise the existing businesses operating based on agencies’ past approvals, and rezone these sites from ‘Residential’ to ‘Residential with Commercial at 1st Storey’. 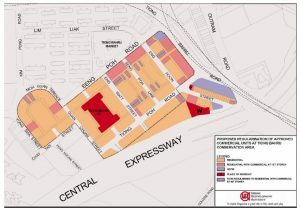 Rezoning the sites will specify under the Master Plan where commercial uses are allowed in the estate. This also reinforces URA’s commitment to support its vibrant landscape, while recognising that the Tiong Bahru neighbourhood is primarily a residential estate. The community has also provided information on some 1st storey businesses that may be operating without approval, at premises meant only for residential purpose. URA said that it is engaging the affected business operators and owners/tenants to work with them to address the infringements. If you looking for some residential sites, our Panel of Property agents and the mortgage consultants at icompareloan.com can help you with affordability assessment and a promotional home loan.